Lets you set the course\tees for which a course handicap is calculated. According to the USGA, a golfer does not play off his USGA Index. Rather, he converts the USGA Handicap Index to a Course Handicap and plays off the Course Handicap. The formula for conversion is Handicap = Index X (Slope of course / 113). That is, the course handicap equals the golfer's index times the slope of the course and tees being played divided by 113. 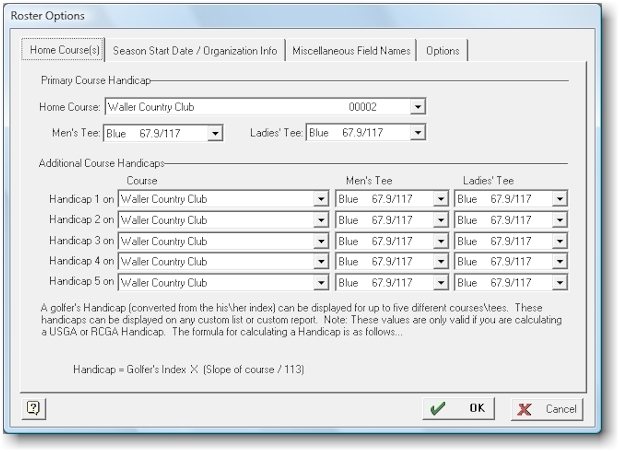 The first (top) course on this form is the Primary Home Course and is displayed as the handicap on all lists and reports. You can also set and display home course handicaps for up to 5 additional course\tee boxes. These Additional Course Handicaps can be displayed on any custom list view or custom report. Example: Set the 5 (or fewer) Additional course values to whatever course and tee you choose. Click the View menu and select Custom Views. Load the Many Course Handicap view. You will see up to 6 handicaps for each golfer on the screen. The SEASON START is the date your golf season started. HS uses this date to track the number of scores a golfer has since the season started. The organization name and address appear on most reports. Name the fields anything you wish. For example, you will notice the first date field is by default named "Birthday". To enter data in any of these fields, double-click a golfer to view the Golfer Information form and click the Miscellaneous tab. 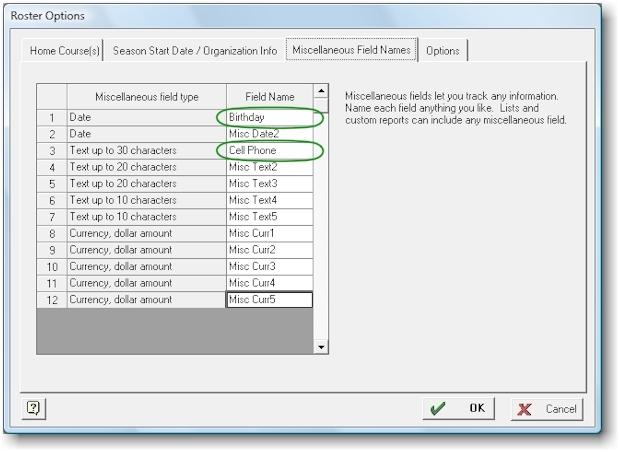 These fields can be displayed on any custom view or custom report. Use alternating colors on the main list. Mark this option to show the main golfer list with alternating colors. Makes the golfer list easier to read. Highlight scores used for handicaps in color. Makes the scores list easier to read. Use color on the scorecard to indicate par, birdie, etc. Display 9 hole handicaps with a "N". If you are following USGA or RCGA rules you should display all nine hole handicaps with a "N". Do not allow 9 hole scores to be posted with a "T" (indicates a tournament score). If you are following USGA or RCGA rules this option should be marked. USGA does not allow 9 hole scores to be posted with a "T". Last course\tee used is the default for next entry score entry. 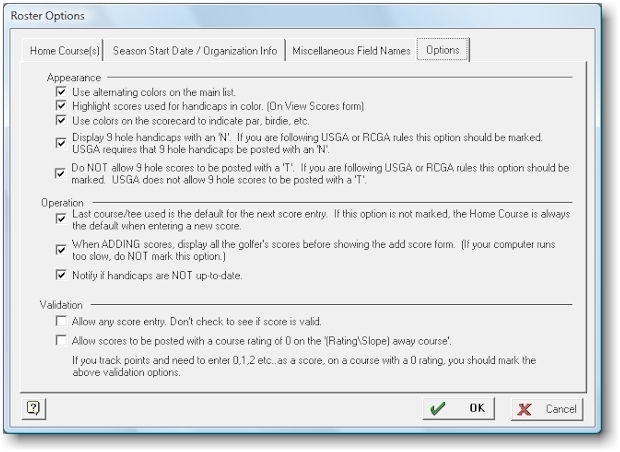 If this option is not marked, the course you have set as the Primary Home Course is always the default when entering a new score. When adding scores, display all golfer's scores before showing the add score form. If you check this option, HS will display all golfer's scores on the right side of the screen before showing the add score form. On slower computers the process of displaying scores between each new score added is too slow and this option should not be used. Notify if handicaps are NOT up-to-date. If you check this option, HS will notify you if new scores have been added or edited and handicaps are not up-to-date with changes made. If you are calculating USGA handicaps you probably want to leave this option unchecked, because handicaps are recalculated at a specified date, not each time a new score is added. Allow any score entry. If you check this option, HS will allow any score entry�including a 0 to be entered. Allow scores to be posted with a course rating of 0. If you mark this option HS will allow you to enter a score on the "(Rating\Slope) Away" course with a rating of 0.